Classically Liberal: The ugly history of "Christian" America. The ugly history of "Christian" America. The Religious Right likes to pant after the “good ol’ days” of “Christian America”. They are a bit imprecise as to when that was but they seem to think it was sometime around the founding of the country. Of course, what one means by founding is important to define. I would generally place the founding of the country between the Declaration of Independence and the ratification of the Constitution. Clearly after that period the nation had been founded. Prior to the Declaration there was no nation either, just separate colonies, often very dissimilar from one another. But our Founders, those men who were key figures in the period, were not, for the most part, what one could call orthodox Christians. The term deist is often used to describe them and it is not entirely inaccurate. Perhaps “deist light” is a better term. In their view of Christianity, they did tend to be deists. But neither were they strict deists. Even Benjamin Franklin, who wrote that he was a “thorough deist,” still saw a more active god than most deists. The founders did think there was a deity who cared about people. But they didn’t think the Bible was his word, they didn’t think Jesus was god in the flesh, they tended to ridicule the virgin birth, miracles, the atonement and a host of other orthodox doctrines. These men tend to inhabit that area of religious belief between Unitarianism, deism and atheism. Where on a religious spectrum each of them fell is open to debate. What really is not open to debate was that they were not on the Christian side of the spectrum, not if you define Christian in theological terms. Some of these men, however, defined Christianity almost wholly in moral terms. And they would use “Christian “as a label to describe their moral intuitions. Often great confusion arises when one fails to realize that a reference to Christianity as a moral system is not a reference to Christianity as a set of doctrines. John Adams said of the Puritans, “ye will say I am no Christian,” referring to the theological doctrines of Christianity. He added, “I say Ye are no Christians,” referring to Christianity as a system of morals. Adams elucidate: “Yet I believe all the honest men among you, are Christians in my sense of the word.” Christian, in his sense of the word, was more found in how one acted toward others, and less in what doctrines one embraced. Jefferson, like many of the founders, saw the theology of Christianity a “corruption” of the system. He wrote: “To the corruptions of Christianity, I am indeed opposed; but not to the genuine precepts of Jesus himself. I am a Christian, in the only sense in which he wished any one to be; sincerely attached to his doctrines, in preference to all others; ascribing to himself every human excellence, and believing he never claimed any other.” For Christian it was the traits of “human excellence” that he saw Jesus teaching. As for the miraculous or divine realm, it was what he said that Jesus never claimed for himself. For this reason Jefferson took scissors to the Bible and cut out of the gospels, all references to the supernatural. He felt such a purge left the pure moral teachings of Jesus and said he was he was happy to embrace that, once all claims of godhood, a trinity, miracles, resurrections, etc., had been exorcised. Between the arrival of Columbus in the West Indies and the American Revolution there were numerous colonies, which tended to differ from one another. It was during this period that Christianity, or more precisely, specific strains of Christianity, did hold political power. If ever there was a time when there was a “Christian America” this was it. It is also a time that most Americans know nothing about. Perhaps because it was a very ugly period in American history, which contradicts the rosy view of America held by most citizens today. Consider the Pilgrims as an example. Most people heard the story that the Pilgrims came to America to enjoy religious freedom. That most certainly is not the case, not if you mean freedom for everyone. Their desire was freedom for themselves and tyrannical control over others. Puritan divine Richard Mather said the Pilgrims came to the colonies in order “to censure those who ought to be censured.” Steven Waldman, in Founding Faith, says that “it might be more precise to say most [Pilgrims] were avoiding the harassment of a government that wanted the Puritans to be more liberal. He mentions how the Puritans had banned games and amusement in areas under their control in England. Certainly when they had control of England, under Cromwell, they went so far as make Christmas illegal. Yes, the first real war on Christmas was conducted by fundamentalist Calvinists against all other Christians. They were most unhappy, later, when King James overturned their bans and granted more liberty to the people. The liberty the Puritans sought was to be able to wield the whip in God’s name, and wield it they did. Quite literally. This yearning for authoritarianism even inspired some Puritans to rebel against the King when the Revolution came along. Rev. James Mayhew, of Boston, said that rebellion against the King is justified when the King commits crimes against God. Since the King had allowed sports on Sunday and “encouraged papists and popishly effect clergymen,” he was against God and thus oppressing the people. For the Puritan, one reason to overthrow the throne, and seek independence from England, was in order to erect a repressive moral regime far stricter than what the lax monarch had allowed. During the early years of colonies the Calvinists saw larger and larger percentages of the colonialists leave their church, or be excommunicated from it, which was not uncommon. In 1684 King Charles II rescinded the part of the charter for the Massachusetts colony, which restricted immigration to Puritans. He allowed Anglicans to have church services, which did not please the Puritans. He also told the Puritans to end their violent, often deadly, persecution of Quakers, something some saw the King interfering with their liberty to kill heretics. 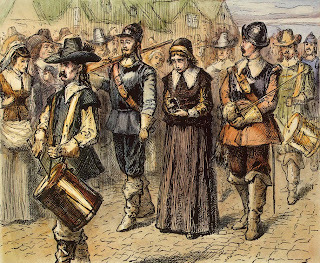 The case of Mary Dyer illustrates Puritan authoritarianism well. Dyer believed that God spoke to individual Christians. She joined with Anne Hutchinson, to form a Bible study group. This act of religious freedom was not tolerated by the Calvinist Puritans especially since she sometimes disagreed with the local cleric. The Puritans informed Hutchinson that Bible forbade women teaching. And in 1638 she was put on trial. She was found guilty of heresy and imprisoned until she could be banished from the colony. Both Dyer and Hutchinson suffered miscarriages at the hands of their tormentors. The godly Pilgrims gloated about the miscarriages saying they showed God’s wrath on the women. Hutchinson went to Rhode Island, which did have some religious freedom. Dyer, along with her husband, travelled to England with Roger Williams, the founder of Rhode Island. There Dyer converted to the Quaker faith, believing it to be similar to what she and Hutchinson had believed. From England she want to Boston, where she was arrested again and expelled, this time for being a Quaker. In 1658 she was arrested again for being a Quaker. After her release she went to Massachusetts to visit two Quaker friends and was again banished from the “shining city on the hill.” Once again she traveled through Massachusetts and this time she was arrested and sentenced to death, along with two other Quakers. Her husband, who was not a Quaker, was friends with the governor and secured a reprieve for Mary but the two Quakers arrested with her were executed. In 1660 she returned to Massachusetts to oppose the laws, which persecuted Quakers. She was arrested and refused to renounce her faith. The good Christian Puritans of Massachusetts hung her for being the wrong kind of Christian. Under Puritan rule only members in good standing of the Congregational Church, the church of the Pilgrims, had voting rights in the colony. When one colonist suggested that this measure be repealed his suggestion was turned down and he was arrested for daring suggest it. The Puritans dominated in Massachusetts, Connecticut and New Hampshire. But the Anglicans dominated Virginia, the Carolinas and Georgia. Rhode Island was unique, in that it was founded by Roger Williams, a Baptist. Williams had been persecuted by the Pilgrims and forced into the wilderness, since being a Baptist was also considered a crime. Pennsylvania tended to be controlled by Quakers. New Amsterdam, the New York City area, was controlled by the Dutch West India Company and never got around to establishing a church, as it was more commercially motivated. But it did find time to persecute Jews and mistreat them. In Virginia the Anglicans who controlled the colony kept out Puritan preachers, Catholics, Quakers and Jews. Jefferson wrote that "the poor Quakers were flying from persecution in England. They cast their eyes on these new countries as asylums of civil and religious freedom; but they found them free only for the reigning sect. As for his Virginia home he said: "If no execution [of Quakers] took place here, as did in New England, it was not owing to the moderation of the church, or spirit of the legislature... but to historical circumstances which have not been handed down to us." Maryland, founded for Catholics, was slightly more tolerant, allowing Protestants. But it decreed the death penalty for anyone who challenged orthodox Christian beliefs. Puritans from Virginia fled to Maryland ,seeking refuge from Anglican persecution, and then helped overthrow the Catholic government that granted them refuge. Once in power the Protestants stripped Catholics of rights, sentenced Catholic priests to life imprisonment, decreed that only Anglicans could hold office and stripped Catholics of the right to vote. During the heyday of Christian American, the one thing Christians were “at liberty” to do, was oppress one another. And this they did with great relish. The founders had lived through much of this era and were fully aware of how the combination of church and state fostered intolerance, violence, persecution, and totalitarianism. They consciously separated church and state to try to avoid such conflicts in the future. The “Christian America,” to which the Religious Right, wishes to return, is an illusion. There was never a time when Christian sects were united in governance. Instead they each occupied areas of control and used what control they could assert to oppress, if not kill, other Christians. There is an illusionary unity amongst the Religious Right even today. The animosity that these sects hold for one another has barely lessened over the years. What they lack is the political power to inflict their intolerance on society as a whole. The Religious Right is made up of some very distinct religious groupings, for the most part. Fundamentalist Christians believe that only those who are “born again” are true Christians. Their Catholic allies, they see as members of the sect of the Anti-Christ, while their Mormon co-conspirators are nothing more than a fraudulent cult. Orthodox Catholics believe that only those confirmed in the Roman church are members of the true Church. Mormons believe that only those who embrace the fantasies of the mountebank Joseph Smith are part of the real Christian faith. To a large extent the only reason they are not at each other’s throats is that they agree there are other throats to slit first: gays, Muslims, and illegal immigrants, for instance. They are willing to set aside their animosity for one another only so long as a more worthy targets of their acrimony exist. If they were to succeed in wiping out the “evil” people of the nation, or at least to force them in hiding, they would soon return to conniving new means for oppressing one another. The founders knew enough about their recent history to consciously separate church and state at the federal level and begin working to separate them at the state level as well—a process that would take a bit longer to accomplish. Illustrations: 1.) 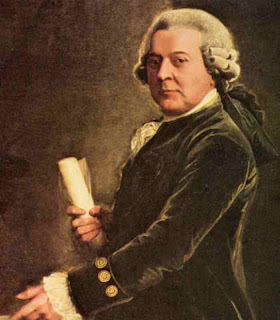 John Adams; 2.) Mary Dyer being led to her execution. The drummers were to prevent bystanders from hearing her speak. posted by blog owner at 3/17/2010 02:32:00 AM DiggIt! Reddit Del.icio.us Slashdot It!